The HDS-PTZ-1 is the optimal choice for High Definition over Coax (HD-SDI) vide camera installations. This HD camera delivers optimum video quality in 1080P resolution over traditional Coaxial lines, and is completely controllable for pan, tilt and zoom. This camera comes with built-in infrared illuminators for up to 150 meter night vision in complete darkness. This camera has extreme high speed capabilities, with up to 350°/second panning capabilities . The built-in electronic 18x optical zoom is ideal for areas where you need even greater clarity. These cameras must be used with HDVRs or HDVR cards that support the HD-SDI format for high definition video. 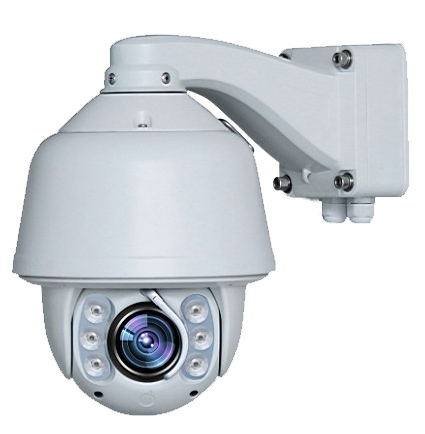 The HDS-PTZ-1 HD-SDI PTZ Dome Camera. We replaced a few of our old PTZ analog cameras with these, and used the AVM HDVR. I knew it was going to be HD, but this is insane. The old PTZs were great for seeing license plates in the first couple of rows in the lot, but with these...I can zoom in on cars across the street now. Nice. The guys from Platinum not only helped us pick out the equipment but also came on site and installed for us. Highly recommend both the camera and the people. Q: Will this camera work with our Lorex DVR? A: That depends on the DVR. Analog standalone DVRs will not be able to record from these cameras, but if it is an HDVR that supports HD-SDI, then it will. HD-SDI is an HD over Coax standard so any DVRs that will record from those cameras will operate. Our HDVRs found here: http://platinumcctv.com/hdvrs all support this camera...very nicely with control for the camera from your PC, laptop, iPhone, Android or Windows phone even.